Your little ones’ senses—vision, hearing, balance, hearing, smell and touch—all help your children to learn better. When their senses are stimulated, it increases the information brought to their growing minds and fine-tunes their nervous systems in the process. Fall’s new sights, sounds, and activities are great opportunities to sharpen those senses – and have fun with the whole family! Get Outside – Nature is ready with lots of lessons! Fresh, cool air awakens the mind and body. Crunchy piles of leaves demonstrate cause and effect. Pumpkin patches reveal ideas of small, medium, and large. Corn mazes teach directions and can help identify left from right. Planting bulbs in the garden shows the value of patience. Nature walks teach the names of brightly colored insects, and the types of trees with rough or smooth trunks. Fall gives opportunities to learn outdoors at every turn! Get Playing – Once you’re outside, don’t forget to play! Running, climbing, skipping and swinging stimulate the vestibular system, which regulates our sense of balance. Lots of vestibular stimulation helps calm your child’s mind, making it receptive for learning. 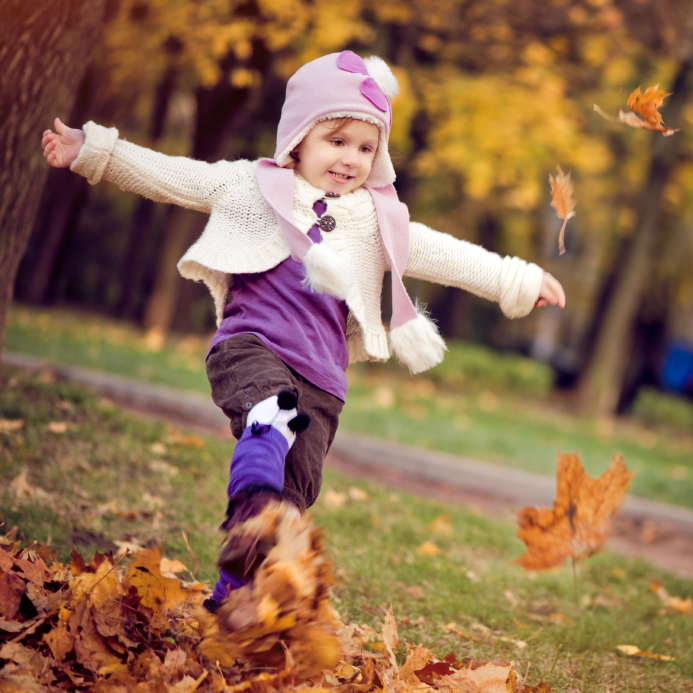 Jumping into piles of leaves, playing on the swings, and learning to throw a football are all great ways to get the body’s sense of balance into action. When your kiddo gets enough running around, he’ll be better able to learn later. Get Cooking – Apples baked fresh from the orchard, decorating cookies for Halloween, and pumpkins picked for pies are all perfect excuses to get in the kitchen with the kids. Learning names of fall squashes, counting ears of corn, and preparing recipes together make for life-long lessons (and family traditions). Here are more of my tips for using your child’s senses to boost his learning, and here’s more about the importance of sensory play in your child’s development. Do you have ideas for boosting learning in the fall months? Please share!